It has been seven years since I had the chance to write about the remarkable album; Numerology (2010, see review). Fibonacci Sequence surprised me with an intelligent blend of instrumental progressive rock and delicate parts of fusion. Now in 2017 a long awaited successor Cinema Finis is released and again without any help of a label, the band will absolutely find its way to aficionados of the aforementioned genres. The band situation has remained stable over the years with drummer Tom Ford, keyboard player Jeffrey Schuelke and guitarist Michael Butzen. Stand in bass player from the Numerology album Chris Kringel now took up the role as the album's producer, passing the bass duties over to “newcomer” Chad Novel. Guests on Cinema Finis are cellist Jake Gresk, violin player Mariah Schultz and voice artist Mark Kreuger. Over these years the music has become more progressive than the equally divided progressive rock/fusion album Numerology was. After the short opener Tickets Please the cinema may be entered. And the entrance is an impressive one, Dream Theater meets Kansas at several points in technique and feeling. Great guitar parts and solos are accompanied by delicate keyboards, Hammond organ and piano. Very strong is the rhythm section, the drums as well as the bass are well placed in the overall mix, making the production sparkling and bright. Psalm Before The Storm is a nice interlude/intro for the following Christofer's Plan. An over ten minute instrumental with a darker, heavier touch. The guitar and bass hail in the lower regions on this one and create that dark atmosphere by repeating their theme. Nevertheless the melodic parts are bright and cheerful and really,.. no doubt about the musical capacities of the individual musicians, just amazing. Another short one; Repent starts as an atmospheric keyboard driven soundscape that leads to an immense solo spot, where Michael can play his heart out. Continuing with Repentless, the progressive rock blends with jazzy and fusion elements; mainly in the catchy melody lines and very, very adventurous drumming. Perhaps a little bit of progressive metal and even post rock have seemed to enter the music. Do I hear a klezmer orientated melody at the end? All in all a wonderful melting pot of sounds and music. Piano and acoustic guitar meet each other over a fretless bass and soft violins during the short Nightshade. 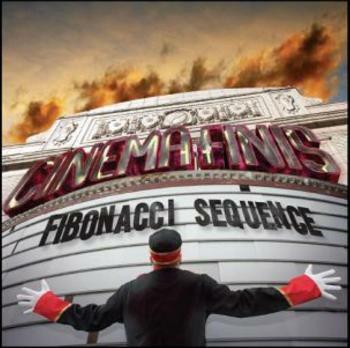 When I read there was a vocal artist present as a guest musician on Cinema Finis, I was curious how Fibonacci Sequence would embed his parts in the instrumental music they produce. After listening to Lobby Song, it all makes sense. Referring to Gentle Giant, or for younger music fans; certain elements of the band Haken, this track prepares you for the next part of the movie. So after you were asked to Take Your Seats, Deus Ex Machina kicks in; technical and powerful. A close to ten minutes heavy ride, filled with fine bass lines, strong guitar melodies and unison keyboards. And again, I am very impressed by Tom Ford's incredibly great drum parts. All Saints' Day paves the way for another fine guitaristic highlight. Both rhythm section and the fantastic keyboards of Geoff are wonderful and provide some solid parts for Michael to lay down his solos. This slightly “softer” track might be my favourite after all. Or,... Incantesimo Di Vistani? I kinda get lost in choosing the track I personally prefer the most. Each track I listen to I tell myself; this is the one. So I am not even going to try to select a “best” track anymore, the whole album is solid, impressive and well played. No fillers here. Where was ? Back to the thirteen minutes of Incantesimo Di Vistani. In my opinion one of the best instrumentals ever made as a progressive rock song. So nicely built, leaving enough space for solo parts and to still keep a thirteen minute song interesting. The addition of the cello and violin in combination with piano is great, especially when a fretless bass is added. Obligated track for die hard progressive rock fans! The theme of the Lobby Song returns musically in the final track of the album; Circumpunct. The last five minutes of an wonderful album. Spoken words are imbedded underneath strong bass sounds and smooth guitar playing. Too bad the album has finished. But I promise to return to the cinema again soon. Seven years well spent I should say; Cinema Finis ends up as an amazing album. If you are a fan of progressive rock and the lack of a vocalist is not a problem, obligated buy. If you are desperate for a vocalist on an album, obligated buy again. This is a magical album.